In our last post on promotional spending best practices, we stressed the importance of collecting the right metrics as the core foundation of good trade promotion analysis and optimization. We stated that measuring in consumer units is the best way to keep a simple and accurate measure of what you’re selling. From this, we showed how to compute revenue, incremental factor, and your spend ratio (see definitions here). For one, you’ll have no idea how much your trade promotions are making until you can accurately compute your baseline (or base, for short) sales (see definition here). First of all, you may need to include point-of-sale data from several of your retail customers, where pre-computed base sales data isn’t available. Second, and more importantly, the base sales data from these syndicated sources are often inaccurate. We can see an inaccurate baseline when we see one of three things: 1) excess volatility in weekly baseline sales, 2) baseline consistently above or below actual sales when there is no promotional activity, and 3) phantom spikes, the baseline jumps up during promotional weeks. The phantom spike effect (technically known as autocorrelation) is theoretically and intuitively impossible. Without promotion, you expect baseline to be roughly the same amount as the prior, non-promoted week. There are several points in response to that type of statement. First, there is no controversy in the industry that these flaws exist. 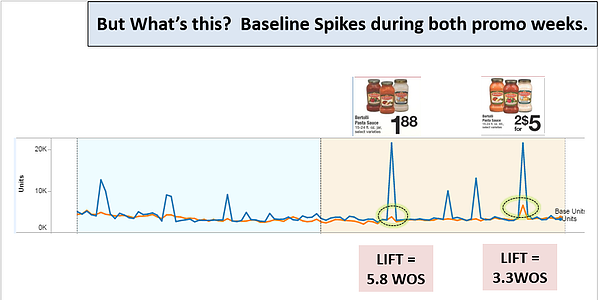 I have been to several dozen companies where I have discussed the issue, and there is never any disagreement that phantom spikes are prevalent in baseline data. Third, and most importantly, though, bad baseline estimates at an event level can provide bad results that will lead to bad decisions. Let’s take a not-all-that-uncommon example that was presented by Tim Carrigan, VP of Sales Capabilities for R&B Foods, at the Promotion Optimization Institute (POI) Annual Conference in April 2015. We see two similar sized Ads on the Bertolli Pasta Sauce Ads. The price points and promotional discounts are different from one another, but the lifts appear to be almost identical. The phantom spikes are obvious, but what’s a little more difficult to see – due to the scaling effect – is that the phantom baseline for the 2/$5 event is much higher than the one on the $1.88 Event. 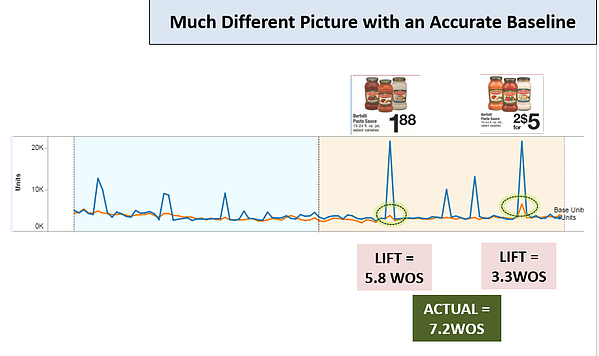 Consequently, the lift on the $1.88 Event looks much better than 2/$5 (5.8 Weeks of Supply vs. 3.3 Weeks of Supply). That’s more than double the incremental sales generated! After we bring in the spending, the data will almost certainly show $1.88 is the better tactic in terms of profitability and lift. With an accurate baseline, the results and the indicated actions are much different. It is a no-brainer to go with the 2/$5. It moved the same WOS as the $1.88, and the buy down costs are most certainly less. Here is a meaningful, real-world opportunity for the company to generate better profitability with a better baseline estimate. It is also worth noting that there is a bad baseline right before the first big spike. See where the baseline (orange) is consistently below the actual units (blue) for roughly 20 weeks? Again, this is impossible. Over time, the baseline should be roughly equal to actual sales during not promoted weeks. Another technical term: the baseline exhibits what we call structural bias. The estimate is consistently below the actual. We have developed a superior alternative to syndicated baselines, TABS AccuBase®, which has been scientifically tested and validated. In our next post, we'll discuss the importance of data harmonization. 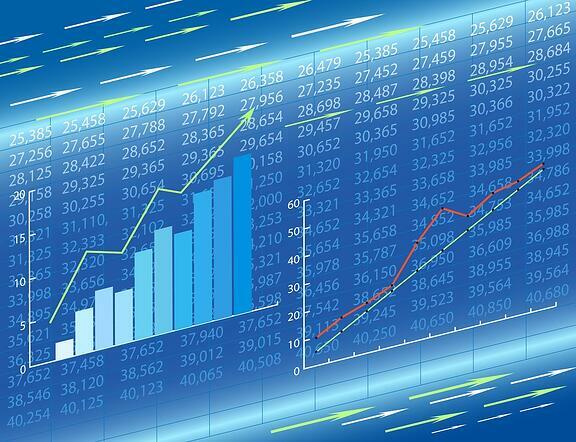 Along with calculating baselines correctly, harmonizing your data properly is vital for all the other steps to fall into place to get to an optimized trade spending plan.